Igers - as frequent users of Instagram are called – post upwards of 100 million videos and photos each day, and many of those are pizzas, burgers, steaks and other edibles. 30% of individuals between the ages of 18-35 actively avoid eateries with a weak Instagram presence, so unless you’re solely catering to older adults, your target customers are scrolling through their Instagram feeds looking for dining inspiration. What’s not so obvious, however, is that many of them are being influenced by brilliantly-crafted restaurant ads. Restaurant ads are an excellent tool for spreading word of mouth about your restaurant and reaching tons of new customers through Instagram. They’re especially beneficial for those in heavily foot-trafficked locations, like tourist spots and downtown areas. But they can be modified for any restaurant’s campaign. In simple words, running restaurant ads on Instagram is a huge opportunity with unlimited marketing potential. Want to target group diners, couples, event planners on Instagram? That’s achievable too with restaurant ads. So whether you’re tapped into Instagram advertising already or need a guide to get started, here’s how to show that ever-oozing Alfredo in restaurant ads and drive hungry diners through the doors. Before you get started consider reviewing whether your Instagram account is optimized for reservations with a reservation system. Igers - as frequent users of Instagram are called – post upwards of 100 million videos and photos each day, and many of those are pizzas, burgers, steaks and other edibles. 30% of individuals between the ages of 18-35 actively avoid eateries with a weak Instagram presence, so unless you’re solely catering to older adults, your target customers are scrolling through their Instagram feeds looking for dining inspiration. What’s not so obvious, however, is that many of them are being influenced by brilliantly-crafted restaurant ads. 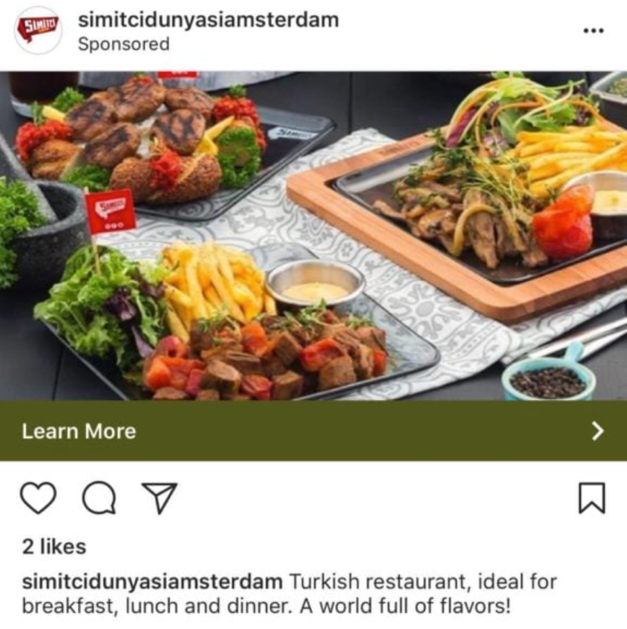 To create restaurant ads on Instagram, you first need to connect your restaurant’s Instagram account to your Facebook Page, which lets you access the Facebook Ad Manager. 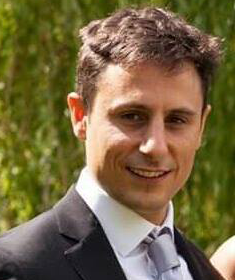 Ad Manager allows you to make ads that run on both Instagram and Facebook. 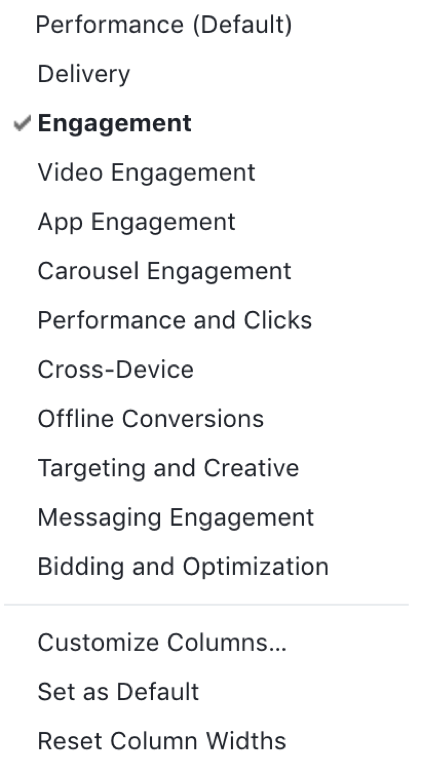 You can also choose what audience to target and customize other features, as well as track how your ads are performing. Get started by visiting the Settings menu of your restaurant’s Facebook page. 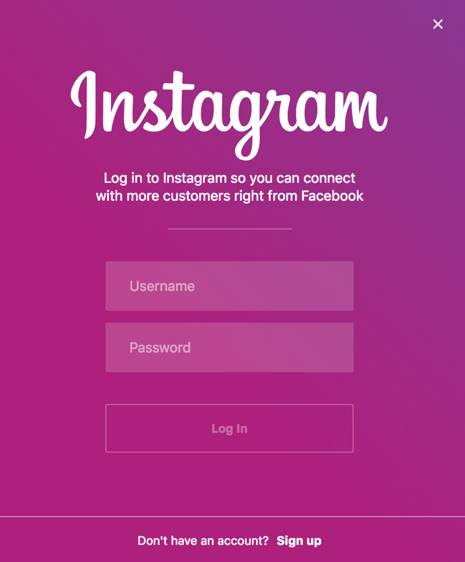 Then click “Log In” and enter your Instagram account credentials. 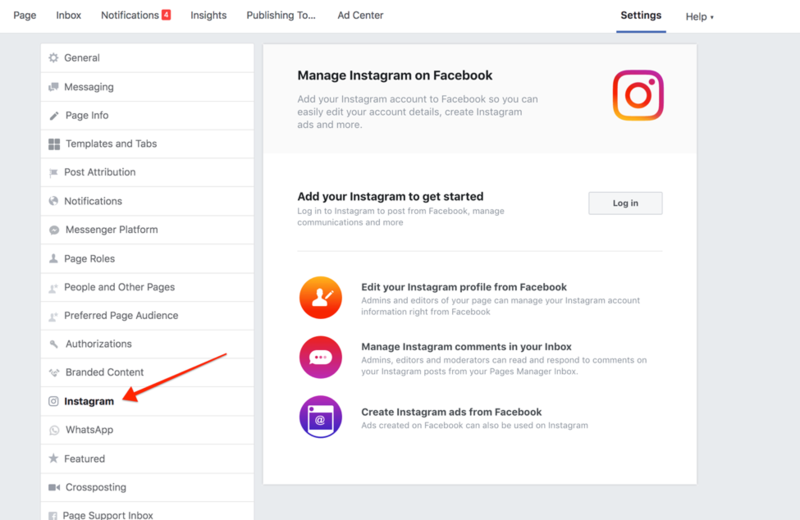 Once you’ve connected your Facebook Page to your Instagram account, it’s time to visit the Ad Manager and create your first ad campaign. If you’re already running restaurant ads on Facebook, most of the steps will be familiar to you. In the Ads Manager, click “Campaigns” and then the “+Create” button at the top left corner of the screen. Next, pick a campaign objective. Next, specify the audience whom you want to see your ads. Restaurant ads are all about trying to find the best people to advertise to – as in, who are likely to take the action you specified in your ad campaign. For example, if you’re a restaurant that specializes in different varieties of Sushi, you’d want to try and target individuals who have an interest in seafood. Fortunately, Instagram has all the same targeting options as Facebook, including targeting based on location, gender, demographics, and more. In general, your restaurant ads need to target a specific country, gender (if endorsing a gender-specific dine-in offer) and age group. For instance, you could target women and men aged 18 to 35 who live in big health-conscious cities and have an interest in seafood. Next, click “Edit placements” and choose where you want your ads to appear. 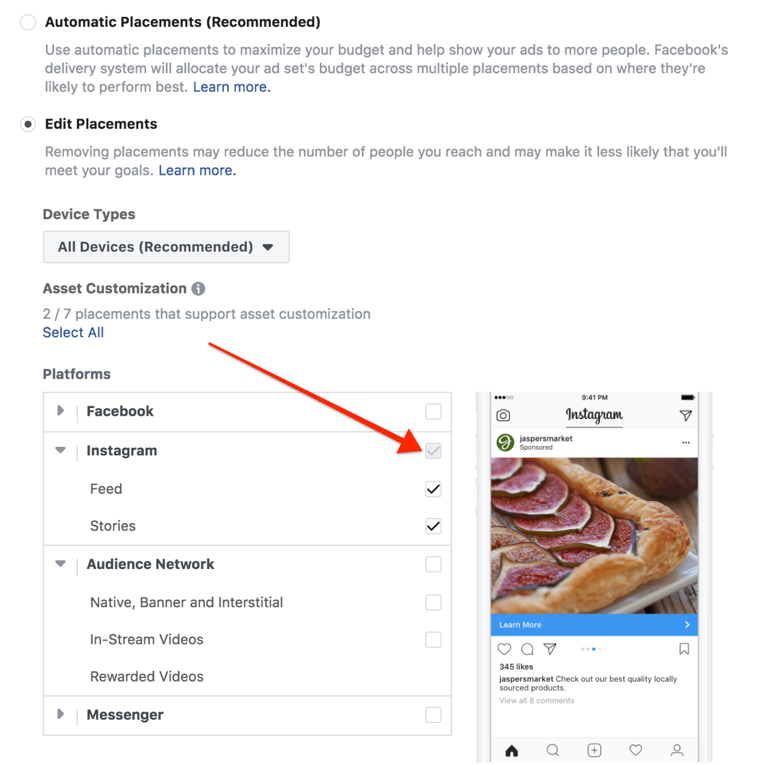 You’ll get the option to run your restaurant ads on Instagram, as well as Messenger, Facebook and the Facebook Audience Network Keep Instagram checked (both Instagram Feed and Stories will be checked by default), and uncheck all other options. When thinking about how much you want to spend on restaurant ads, start low. You can always increase the ad dollars later if your campaign performs well. When you’ve decided how much to spend, click the “Continue” button at the bottom right. The next screen will ask you to choose an Instagram ad format. You’ll also get to see the technical requirements for each format as you choose your videos or images. 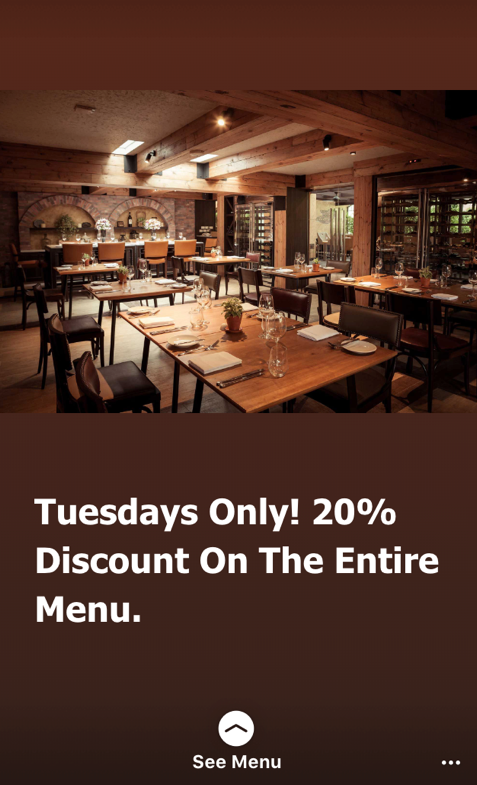 If this is your first attempt at restaurant ads on any social media platform, it’s best to choose Single Image ads. They’re the easiest to create. With Carousel ads, you can showcase multiple items or various uses of an item. For instance, a new pizzeria could showcase how multiple ingredients come together to make a delicious margarita pizza. Once the viewer swipes through the visuals, you can use a call-to-action button to redirect them to a reservation page. You can also set up Video ads up to 60 seconds long. If you go with this ad format, try creating a video that blends organically on your audience’s feed. With Slideshow ads, you can create lightweight videos from a series of still images. That way, the format allows restaurants that don’t have resources or time to create proper video content to create quick light videos from the photos they already have. There is one creative requirement that applies to every ad format: you should aim for minimum text, especially on pictures. 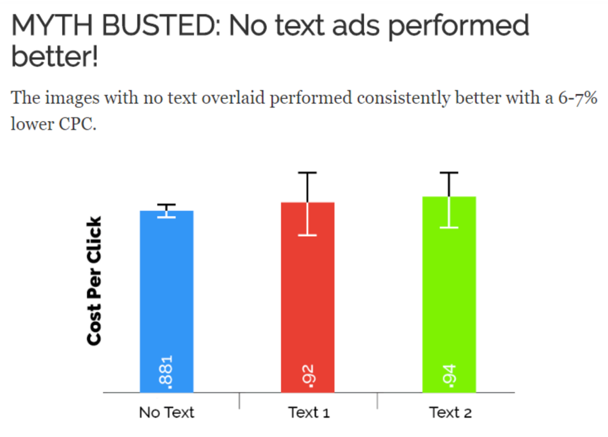 Too much text (which is 20% of the image or more) can limit the reach of your ads. Once you’ve uploaded your video/image/images, scroll down, and there’ll be an option on the left telling you to write a text message for your ad. This will serve as the main description for restaurant ads, in both the Instagram Feed and Instagram Stories. The Ad creation window will also let you insert a URL for your website, and pick a “call-to-action” button to display. For instance, restaurant owners could display “See Menu” or “Book Now” on their restaurant ads. Finally, at the right side of the text window, you’ll be able to preview how your ad will look on an Instagram feed. You can also see how it would appear in Instagram Stories. Once you’re satisfied with everything, click “Confirm” to start running your restaurant ads on Instagram. But your work doesn’t end there. Once your ads are up and running, you’ll want to monitor their performance and test elements to find the most effective visuals, targeting, and format. To see the metrics for your ads, go to the Facebook Ads Manager and open your ad campaign. From there, open the section from the top right corner that includes Audience, Placement data, and Performance. Based on your chosen objective form the campaign, you’ll see different results. For instance, if you picked the “engagement” objective for your restaurant ads, you’ll see how many engagements your In-Feed or Story ads have received, as well as the number of people they’ve reached. You can also access the Cost per Engagement and Total Amount Spent to understand how your campaign budget is being spent. As a best practice, if your campaign performs well, you should increase its budget every week. However, if it fails to deliver, change your creative, targeting parameters, etc. to see if improves. Instagram is one of the best channels to get your feet wet with restaurant ads because it’s image-oriented rather than text oriented. Since visuals do a great job at inviting people to come in for breakfast, lunch, aperitif, or dinner, they really set the scene. Hence, integrating Instagram advertising into your marketing strategy is a wonderful idea that’ll help you finally turn up the heat for your restaurant.